We’d like to introduce the latest creation to leave the ACH Classic workshop. 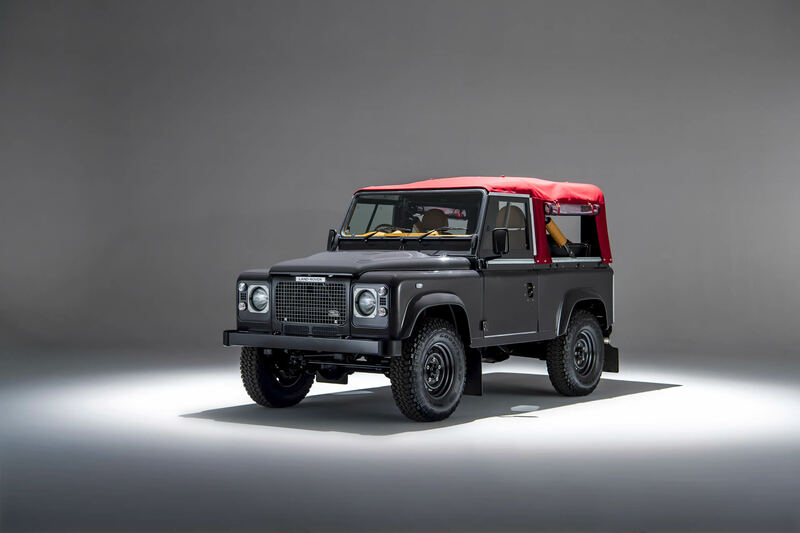 We believe this retro styled Defender 90 sets a new benchmark when it comes to luxury, classically inspired Land Rovers. Built on a low mileage chassis this Defender is all about the detail. From the stunning Porsche Black Grey paintwork to the stainless-steel rivets that adorn the bodywork, every millimetre has been painstakingly inspected and reworked. The retro style has been achieved by removing the doors and replacing them with doors made to fit a Series 3 Land Rover, the door tops are military spec sliding types that flow perfectly with the rest of the vehicle. All steel cappings have been stripped, galvanised and then aged to enhance the look. The front is set off with an exact reproduction of a Stage One V8 grille made from high quality stainless-steel coupled with Series 3 headlamp surrounds, both painted in a darkened Aston Martin Silver Birch. The hood is a beautiful maroon Mohair that we think sparkles against the powerful grey of the body and is held up by, not Land Rover’s original hood sticks but a full safety roll cage to protect the occupants in the event of a roll over. As you would expect the roll cage is colour coded to the rest of the body and looks great with the hood on or off? The interior has been soundproofed throughout before the grey ridged carpet was laid, edged with the same tan leather that fills the car’s interior. The seats and door cards carry a stitch that we feel harks back to the luxury cars of the sixties and fits in with the image that this Land Rover portrays. Its not all retro when it comes to the interior however, heated seats have been fitted for those cold roof off mornings in the Autumn but the more obvious edition is the 7-inch Alpine stereo unit. This system includes Sat Nav, Bluetooth, DAB radio, eight speakers and a 400w amplifier so even with the hood off, the sound is sublime. The final addition to this fabulous interior is the stunning riveted Mota Lita steering wheel made especially for this project, enhancing the drive of this Land Rover along with our very own adjustable shock absorbers making this one of the most comfortable Defender 90s we have ever driven. This Defender was stripped down to the bones, the chassis was then carefully blasted before receiving an etch primer followed by a generous coating of semi-gloss hard wearing black that we have developed with our paint provider. The chassis was then sprayed internally with a special wax coating that will keep it free from corrosion for many years. Whilst all the body parts were removed, they were painstakingly stripped, reworked and finally painted in our very own paint facility. Many, many hours went into producing the best finish you will find on any Defender or indeed any classic car. The Land Rover was the assembled again using the finest fixings from top grade stainless-steel giving a long-lasting finish that shines against the paintwork. If you’d like to talk to us about this Defender or indeed any of the services we provide then please contact or pop into our Silverstone showroom.